Beneath a sign reading “Are you a smoker? 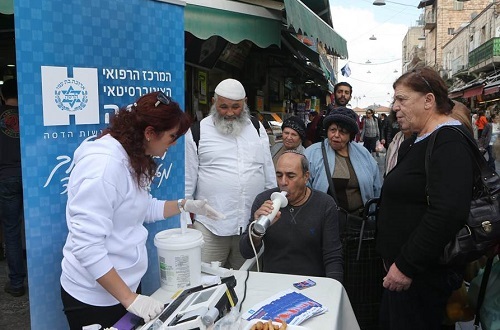 Come and be tested by Hadassah lung experts to see if you are in danger of COPD”, Hadassah medical staff offered COPD testing and information. More than 150 shoppers and vendors were tested amidst the tomato, cheese and halva stands in Jerusalem’s open-air market Macheneh Yehudah. Twenty five showed signs of this disease. This is the first time that Hadassah has gone out into the field to test smokers, instead of inviting smokers to come to the hospital. 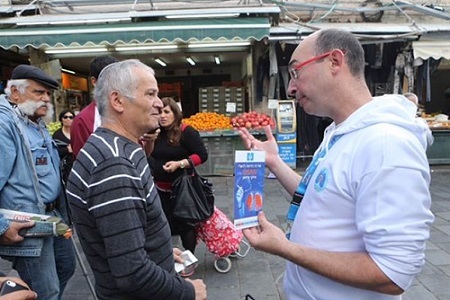 The initiative was part of marking world COPD day, and demonstrates Hadassah’s continued commitment to the community. Please go to the Jerusalem Post http://www.jpost.com/Business-and-Innovation/Health-and-Science/Free-COPD-tests-offered-in-Jerusalem-market-today-434449 to see the announcement about the event.